An award receiving function for �Gandhiya Chemmal� Mr. M.L. 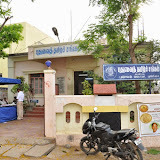 Rajesh took place, here at Pondicherry on the 17th of April, 2013. And as a sequel to this event there had also been a Gandhian memorabilia exhibition on the next day. 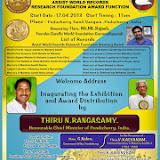 As a token of acknowledgement of the various triumphs by the Gandhi World Foundation, the Assist World Records and research Foundation conducted an award distribution function at the Pudhuvai Tamizh Sangam here at Pondicherry. There had also been an exhibition to commemorate M.K.Gandhi on 18th of April 2013. To add on Feathers on our cap, The Assist World Records and research Foundation had presented with various awards and mementos to the “Gandhiya Chemmal” Mr. M.L. Rajesh, founder of Gandhi World Foundation on the 17, 18th of April 2013, to appreciate his thoughtful activities and movements. This award function included the highest award given by the Assist World Records and research Foundation, award for the highest amount of Gandhi memorabilia, and also for the first website about Mahatma Gandhi which resulted to a total of 14 prestigious awards. There were many leaders including the Honorary Chief Minister of Pondicherry, Mr. N.Rangasamy, Korada Mr. G.Nehru, Mr. Gandhi Kanakaraj, Actor of the movie Mudhalvar Mahatma, and also the personal secretary of Mahatma Gandhi during the time period 1944-1948, Mr. V.Kalyanam and also many social workers who participated and graced this occasion. The event was headed by its founder, Mr. R. Rajendran and it saw the prestigious Assist World Records and research Foundation award that was handed over to the “Gandhiya Chemmal” Mr. M.L. Rajesh by the honorary chief Minister Mr. N. Rangasamy. Also all the social workers of the Gandhi World Foundation were distributed mementos by him. The following day, the Gandhi memorabilia exhibition saw the graceful participation of the honorary Assembly leader Mr.V.Sababathy, Mr. P. Rajavelu, Minister, Department of Tourism and also many social workers. The honorary Assembly leader and the tourism department minister distributed the other 13 awards to the “Gandhiya Chemmal” Mr. M.L. Rajesh and graced the occasion. The other social workers of the Gandhi World Foundation were also presented with certificates by the honorary minister of Tourism Department. We would like to sincerely thank the mastermind behind the event, Mr. R.Rajendran, founder of AWRRF and also the others who had been of great help in relation to this.